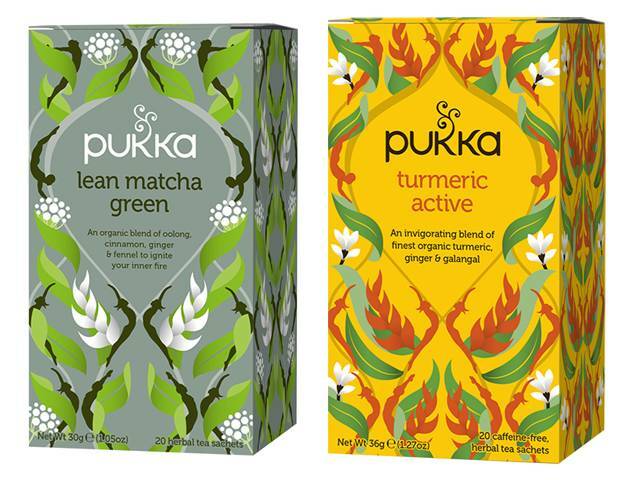 Expertly blended to support the body in performing at its best, Pukka launches two new teas Turmeric Active (RRP $7.95) and Lean Matcha Green (RRP $7.95). Created using medicinal-grade herbs that are certified organic, Fair for Life and FairWild, both teas are delicious and nourishing additions to the Pukka range. Pukka's Turmeric Active tea is a warm, spicy and invigorating blend that combines a potent blend of super herbs known for helping to protect, strengthen and nourish the body. The tea's hero ingredient, Turmeric, contains a high level of antioxidants to help reduce inflammation, alleviate pain and strengthen the joints and tendons, while protecting the muscles from damage. Warming Ginger has been added to help provide relief from painful musculoskeletal conditions and increase blood flow to the joints, while natural pain killer, Galangal, helps to reduce aches and pains and stimulate blood flow. Additionally, Nettle helps to reduce fluid retention and inflammation, while Celery Seed works as a cooling diuretic that cleanses joints and cartilage, while improving blood flow. Pukka's medical herbalist and Ayurvedic practitioner, Sebastian Pole, says that Turmeric Active is suitable for everyone. "From active bodies and sports enthusiasts to desk dwellers and the less mobile, Turmeric Active has been formulated to support those in recovery from injury as well as to help protect the muscles from further damage," he says. Offering support to the body in a slightly different way, Pukka's Lean Matcha Green tea is blended to help naturally boost the metabolism, balance blood sugar levels and help maintain a healthy body composition. Organic metabolism-boosting, thermogenic (fat-burning) ingredients such as aromatic Oolong and uplifting Matcha Teas have been blended with spices such as sweet Cinnamon to help balance blood sugar levels and spicy Turmeric for its anti-inflammatory properties and ability to reduce irritation, heat and pain within the digestive tract. This warming cup of organic bliss includes notes of therapeutic Fennel, Ginger and Black Pepper as well as stimulating Triphala, which helps to cleanse the blood, mildly stimulate the bowel and decongest the digestive system. Pukka's philosophy is that every Pukka cuppa should not only be good for us, but should taste good as well. That's why Lean Matcha Green and Turmeric Active are made using the finest FairWild, organic herbs to create a deliciously bold and boosting cup of herbal bliss.